By Terri Woods – I sell real estate in Santa Cruz, Aptos, Rio del Mar, Capitola, La Selva Beach, Watsonville, and North Monterey County – Call Terri today! Are you paying rent for an apartment? Have you considered owning a CONDO? Visit my website for full details and photos of all available Condos for Sale in Aptos, CA 95003. Our for sale property information is a direct feed from the local MLS and is updated several times daily. 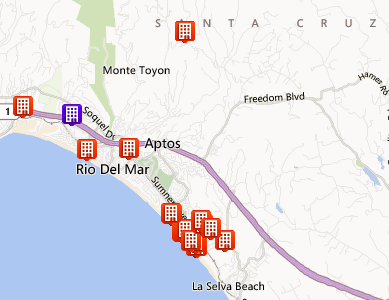 The number of active listings in Aptos (95003) dropped by 7.4% from the previous month. The median number of days active properties have been listed is 89. • There are usually fewer maintenance requirements. • They can be less expensive than a single-family home. • You own the space between the walls. • There may be more security with neighbors close by. • The exterior of the building, landscaping, surrounding roads, driveways and common areas are owned by the condo association, a group made up of all unit owners. Open Houses (Condos) this weekend – Tell the agent Terri Woods sent you. SELLERS: Want to know your HOME’S VALUE?